We’d love your help. Let us know what’s wrong with this preview of Kulkosvaidžius paruošt! by Johnnie M. Clark. To ask other readers questions about Kulkosvaidžius paruošt!, please sign up. Be the first to ask a question about Kulkosvaidžius paruošt! Recommends it for: anyone interested in Nam. Recommended to Art by: Terry Linscott Sr. The Corps and Vietnam from a 1st person point of view. My unit in Germany had the best kept and firing M60's in our Battalion. I was real proud of this due to that of the use of gun jeeps in my unit. Also I liked how Chan kept quoting scripture to the author and in the end, He quoted Chan's words back to him. I would read more of Clark's work. A different perspective of the Vietnam War. Told from the view of a PFC 0331 grunt. Just the down and dirty of day to day life and death actions taken by the individual Marine. Many of the books on this topic are written by officers who see the war through a wider lens. This was a more down and dirty, do what your'e told without know why. The friendships made and lost. I enjoyed every aspect of this book. I was especially pleasantly surprised to see that I had actually served under one of the cha A different perspective of the Vietnam War. Told from the view of a PFC 0331 grunt. Just the down and dirty of day to day life and death actions taken by the individual Marine. Many of the books on this topic are written by officers who see the war through a wider lens. This was a more down and dirty, do what your'e told without know why. The friendships made and lost. I enjoyed every aspect of this book. I was especially pleasantly surprised to see that I had actually served under one of the characters while attending boot camp at Parris Island. It's an odd feeling, dealing with war classics. You know on the one hand that posterity has declared this to be a memoir classic, but Recommended as "one of the top Vietnam War memoirs" (I think actually by a UK newspaper, possibly by a UK war writer), GUNS UP! is a sort of full-blooded, full-throated war memoir that follows a Marine ranker and his best friend, Andrew Chan, a Chinese-American, who are both machine gun operators and summoned by the call "Guns up!" when their platoon makes contact. Life as a Combat Veteran...... well described. This book is one of the best in describing the existence and survival of a combat veteran in Vietnam. I was a RTO roaming the hills around Dak To, Kontum during the Tet Offinsive, and even though I was Army, life in the bush was the same. I was also wounded and received the Purple Heart.......but unlike some of my "brothers who gave all" I was able to return home. Mr Clark's account of the miserable life, and the constant fear in attempting to survi Life as a Combat Veteran...... well described. Mr Clark's account of the miserable life, and the constant fear in attempting to survive, is true to form. It was pure Hell!! Guns Up!... is a must read, especially for the cowards who ran to Canada, protested, and treated the returning soldiers like trash. Thanks you "brother" for telling your story. I'm also a Marine vet. who was there during this time period,and I just want to say that the descriptions and recollections in this book are the real deal. He has captured the crazy mixed up way that it messed up who you thought you were as a person,and also how you knew then,and know now that some part of you is buried there in that far off land. I was sorry when the book ended. I wanted to read more. I would recommend this book to anyone that would like to learn more about that horrible war. It is very sad how the news media twisted the facts, and many people believed their lies. They haven't changed. This book was totally engaging and very satisfying. It succeeds on several levels. The account is from a 'grunts' perspective so you get the undiluted reality of what bush warfare is all about. The action is intense but there is also a good mix of dark humor to keep the story from becoming completely grim. Clark is both honest and humble and his Vietnam journey is also a journey of spiritual awakening and faith. Read this in high school--just pulled it off the shelf while on a dreary road-trip vacation with my family, which was pure, stifling hell. This book was my relief. Pure tonic. I loved it. It was my first exposure to the American Vietnam war, and that relationship has lasted a lifetime. I'm giving it five stars for all of that. Extremely held my interest. I was there (Vietnam) but as a Seabee. I didn't experience the adrenaline rushes of close combat and glad I didn't. War is sad but if you survive, you have friends for life. The author definitely put you next to him during the fire fights. This book projects how brave the young men were that served in Vietnam. The men that served in the bush lived a very rough life. The people that rejected them when they came home should ashamed of themselves. They are truly heroes. Man labai patiko ši knyga!! Guns Up! is a red-blooded war memoir by a Marine machine gunner. Clark's war was ugly: arriving in-country just after the Tet offensive, he marched through minefields, terrible weather, and endless jungle and mountain patrols. The big M60 that he carried was a life-saver for the squad, but the stream of orange tracers guaranteed return fire, and machine gunners reportedly had a 7.5 second life expectancy in combat (I want to know which RAND analyst figured that out, and who told the grunts.) The Guns Up! is a red-blooded war memoir by a Marine machine gunner. Clark's war was ugly: arriving in-country just after the Tet offensive, he marched through minefields, terrible weather, and endless jungle and mountain patrols. The big M60 that he carried was a life-saver for the squad, but the stream of orange tracers guaranteed return fire, and machine gunners reportedly had a 7.5 second life expectancy in combat (I want to know which RAND analyst figured that out, and who told the grunts.) There's battles, ambushes, and all the stock characters of war. Do the Marines issue giant guys named Red, taciturn Indians, and Boston snobs at a rate of one per platoon? What makes Guns Up! exceptional is the friendship between Clark and his alphabetical buddy since bootcamp, Richard Chan, a brilliant and devout Chinese-American who serves as a kind of moral center in an amoral universe. This isn't Dispatches or Where the Rivers Ran Backward, and Clark tells his story directly. One thing that stands out is that combat troops were used hard: Clark is either in the field or in the hospital. He lost 40 pounds in six months, from marching, stress, and bad food. His interactions with the country were entirely through gunsights. Friends die or are seriously injured and replaced with boots, and the squad keeps going on after objectives that don't change the course of the war. Authority, such as it is, are corporals and rumors over the radio net about what the rest of the battalion is up to. Guns up! Is a very good book about a young Marine during the Vietnam war. There is a lot of gut wrenching scenes described and a lot of heart break. You will learn more of what those brave men we're doing in Vietnam. The first thing I noticed about this book was the fast paced story telling. The flow if you will. I am used to authors describeing, sometimes in too great, of detail the environments and settings of the characters and places. This book seemed to speed along from one important point t Guns up! Is a very good book about a young Marine during the Vietnam war. There is a lot of gut wrenching scenes described and a lot of heart break. You will learn more of what those brave men we're doing in Vietnam. This book seemed to speed along from one important point to the next. I liked that. It made me want to keep reading! Secondly a lot of scenes described reminded me of a lot of Hollywood war movies. I'm sure Hollywood got a lot of their Ideas from books like this. This has a lot of "Human" in it. Lots of emotions. It also has a lot of history, religious and political undertones throughout the book. The heart of it is between the main character and his best friend! I could go on and on about how important this book is to us as a nation and humanity for that matter but that is just may ruin it for you. Oh and yeah the author chose not to put swear words in the book. I read a review where the person was upset because of this. We all know Marines most likely swear like crazy but the author chose not to put it down. That does not down-grade the book in any way to me. Why would that matter? Its easy to fill in your own words if you really need to. The only reason I'm giving it 4 stars instead of 5 is because I wanted to more!! This book was a very good read. The author is obviously a practicing Christian. The book is raw in its combat detail but without the course language that surely would have been typical of the setting. The Christian undertones in the book provide a strangely comforting sense to the situations the author experienced. I really liked that aspect. I highly recommend this book to anyone who wants to "view" the hell that was Viet Nam for our fighting men during that terrible time. Guns Up immediately got me into the story. It is a great account of jungle fighting in the Vietnam War as told by a person who experienced it firsthand. This was not some big adventure with a fantastic over-the top plot. It was a down to earth account of being alongside combat buddies while trying to survive. The story was personal, realistic with a lot of detail and it made for a great read. I think about this book often and have recommended it to several friends. As a Marine veteran [of OIF], of course I'm going to like this book, but it goes beyond that. This is by far the best book on Vietnam I have read, it really gets down and dirty to give you the story from a grunts point of view. I laughed as he mocked pogues as I saw his experience from 40 years ago mirror what grunts still do to this day. This book will make you laugh, make you feel sad when someone dies, and definitely give you chills. A must read for anyone who has the ability to read. 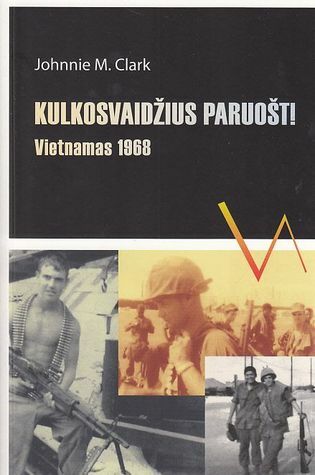 This is a book about the war in Vietnam. It's a true story, written by a marine who survived harrowing situations. It's well written, and there seems to be a pervasive Christian theme throughout the book, which is good. But that doesn't necessarily make it a Christian book...there is swearing etc... wouldn't recommend to anyone. I could not believe how tough this must have been. How hard to accept the fact that your life was in the hands of politicians and 'pogues' who were not themselves in danger. I can understand that a lot of people disagreed with the Vietnam war, but not with the fact that the returning vets had such a hard time. I recommend this book to anyone, especially if you don't think you have courage. The author, obviously a devout Christian, makes a point in the book's epilogue of saying he the swear words in order to give the book a better chance of being sold. To read a book about soldiers in combat without a single word just doesn't ring true. Other than that minor complaint a very entertaining and well done book. This book is amazing! I found myself thinking I was actually there. I could hardly put the book down. Nobody should have to through want these Marines went through. For bless them all! My husband wanted me to read and it was good! Not my normal type of reading material, But I culdn't put it down. Really enjoyed this book. It's a story of sacrifice, faith, courage, and war that is really powerful.